What is the narrative spine of your piece? Sensei and his students try to keep Japanese swordsmanship alive despite the media’s false representation. Who are your main characters? What are your plans to get footage beyond boring talking head shots? Our main characters are Fei Fei Chang, Francis DaCosta, Tim Smith. Our plans for getting additional footage include a night time shoot at Lake Merrit, attending a class at the dojo, and filming more advanced students during both training and tests. The conflict that drives the story revolves around how students expressing their passion are almost immediately compared to inaccurate media portrayal. We would like to see students more open to express their love of the art, and in the end leave people with more accurate ideas of what it entails. The inciting point is a quest of trying to discover what samurai culture is compared to media portrayal. The entry point is through the students of Suigetsukan Dojo. The night time shoot presented some lighting issues when trying to get clear footage in the low light of the moon. Other difficulties include being unable to use flash photography when taking stills of the training, leading everything to being adjusted manually. Core Concept: Sensei and his students try to keep Japanese swordsmanship alive despite the media’s false representation. The movie will open on a close up of a sword being unsheathed. It will transition from there between shots of students getting ready to train and quotes from one of the art’s founders, Nakamura Taizaburo Sensei. This will bleed over into footage of students training, and from there move on to an interview with Mike Esmailzadeh. The movie will end with students doing cool down exercises and folding their hakimas. The final shot will be the sword from the beginning being slid into its sheathe. Both of these will demonstrate the core concept of the art’s reality in comparison to sparse media clips that will be used to provide contrast. As I was unable to obtain “Spirit of the Sword” on short notice, our reading research consisted of the resources on the Suigetsukan Dojo Website. The dojo teaches multiple martial arts. Suigetsukan means Moon Reflected on the Water School and was founded in 1991. The art of Toyama Ryu is deeply rooted in Japanese history and has been used in combat as recently was WWII. Our viewing research was confined to the media, to get a sense of how they portrayed samurai in movies and on tv. To achieve this we watched Seven Samurai, Thirteen Assassins, and Samurai Delicatessen. Of the three, Samurai Delicatessen was far and away the most inaccurate of the portrayals, something that is not really surprising as it is an improv comedy bit. In the case of the two movies, Thirteen Assassins and Seven Samurai, they take the art more seriously, but even they spiced things up for the sake of looking good on film. Listening research consisted of talks with Sensei Mike Esmailzadeh after our first group session at Suigetsukan Dojo. Each technique is rooted in historical context, which Sensei Mike Esmailzadeh was always sure to include in the lesson. An example of the above is the clan sword technique. This is the origin of the “sword catching” myth, but when examined properly, it becomes clear that it is born of the warrior culture mindset of laying down your life for your people and country. It consists of “catching” the sword with your shoulder and holding it there. Then you apply downward pressure on their hands and move in close. This allows you to either take them with you, as you are about to die anyway, or to hold them long enough for one of your clansmen to move in for the kill. Swords by the Lake plans on using two or three approaches to educating people about Toyama Ryu Battodo. The primary approaches are poetic, used in katas and training sequences. Expository voice over will be used to explain the art to viewers. The final approach is participatory, with the Thousand Fold Productions film crew participating in a taped class. In the Eyes of Madness is a documentary that strives for an honest look into the life of an individual with a mental illness and how it affects them. Some mental illnesses have symptoms that overlap with another disorder, which makes them much more tricky to accurately diagnose. In today’s example we will be looking at an overlapping symptom of bipolar and schizophrenic patients. While the symptom of hallucinations, that is seeing or hearing things that are not there, is well known enough in schizophrenic patients as to be stereotyped by Hollywood. Less known, however, is the tendency for bipolar patients in the grip of either intense mania or depression to succumb to bouts of psychosis. Psychosis encompasses hallucinations as well as delusions, strongly held but false beliefs. Hallucinations, both auditory and visual, can range from the innocuous, such as hearing faint whispering just around the next corner, to ominous and otherworldly sounds. Below is an example of one such sound that I have heard while in this state, recreated to the best of my ability. “Bipolar Disorder.” Symptoms. Web. 9 Feb. 2015. 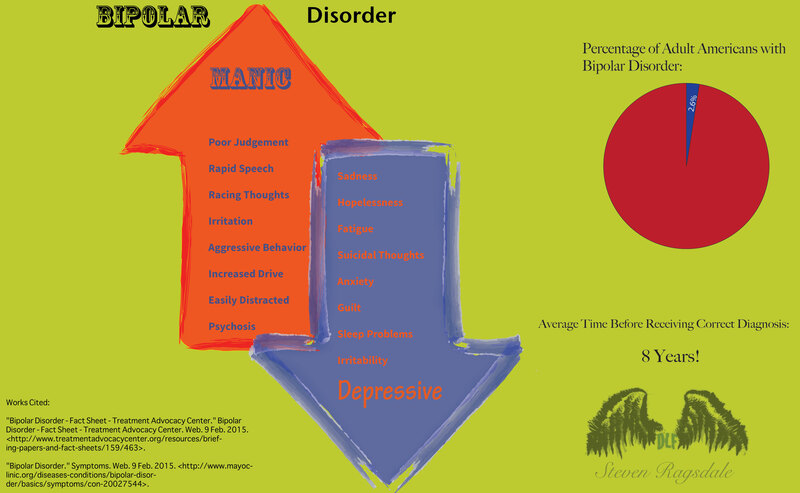 <http://www.mayoclinic.org/diseases-conditions/bipolar-disorder/basics/symptoms/con-20027544&gt;. “Schizophrenia.” Symptoms. Web. 9 Feb. 2015. <http://www.mayoclinic.org/diseases-conditions/schizophrenia/basics/symptoms/con-20021077&gt;. This second song doodle attempts to capture the dissonance with which I view the world when my mood inevitably shifts downward.